JOBS Coalition Pathways is a quarterly newsletter dedicated to covering the JOBS Coalition’s core issues of workforce development, vocational education and recidivism as they impact District residents. The newsletter highlights the coalition’s ongoing collaborative efforts to remove employment barriers and strengthen resident job training opportunities citywide. 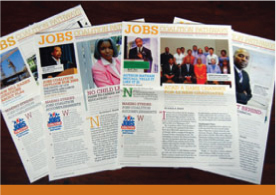 It also features inspiring stories of youth and adults finding success through career and technical education. Launched in 2002, JOBS Coalition Pathways reaches approximately 1,000 elected officials, clergy and private industry employers throughout the Washington, D.C. area to spread the word about the value of hiring and retaining workers. JOBS Coalition Pathways: Building Pathways of Promises.